Joint injections (with “cortisone”) or aspirations (taking fluid out of a joint) can be helpful both diagnostically as well as therapeutically. They are usually performed in the office with a cold spray or other local anesthesia. After the skin surface is thoroughly cleaned, the joint can be entered with a needle attached to a syringe. 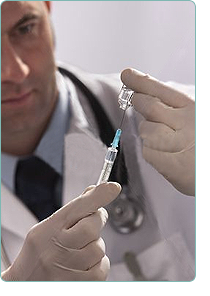 Joint injections are performed by the physician. Taking fluid out of the joint can be done and sent for laboratory analysis or examination by a physician. Lab tests include cell counts (to determine numbers or white cells or red blood cells), crystal analysis (to look for gout or pseudogout crystals under a microscope), and/or culture (to determine if there is infection). This information can provide the physician with clues as to what could be causing pain and/or swelling. Corticosteroids (most often triamcinolone or methylprednisolone) are frequently injected directly into the joint, and act as a strong anti-inflammatory agents to reduce pain and stiffness. When there is accumulation of fluid in a joint, drainage of this fluid can also provide considerable relief of pain. Conditions often treated with joint injections include Bursitis, Tendonitis, Rheumatoid Arthritis, Gout, Osteoarthritis, Psoriatic Arthritis. For Osteoarthritis, hyaluronic acid (ie. Supartz, Hyalgan, Synvisc, Orthovisc) can also be used. These are viscous lubricating substances that may relieve pain in the knee for up to 6-12 months. Most commonly injected joints include the knee, shoulder, elbow, ankle, wrist, base of thumb, and other small joints of the hand. Hip joints can be injected with the use of Ultrasound (see ultrasound section). Ultrasound can also be used to injection small joints, like in the hand and wrist. Areas of bursitis, tendonitis and tendon sheaths can be injected as well, like trochanteric bursitis, elbow epicondylitis, carpal tunnel syndrome, trigger finger, plantar fasciitis. As with any procedure, there is a small amount of risk. Occasional allergic reactions can occur, to the cleaning substance or tape. Infections are rare complications, about 1 in 15,000 patients (source ACR). Post-injection flares can rarely happen, where there is joint pain and swelling several hours after the injection. Other infrequent complications include whitening or thinning of the skin injection site, or tendon injury. Repeated or numerous injections to same area is discouraged. Trigger point injections are a different type of injection which can also provide pain relief. Trigger points are focal, hyperirritable spots located on a band of skeletal muscle that associated with pain. They can involve a knot or a tight band of muscle that fails to relax, which produces pain locally and can refer to other areas of the body. Trigger points are often associated with chronic musculoskeletal disorders, including myofascial pain. Trigger point injections can be done in the office visit, and more than one trigger point can be injected at a time at the discretion of the physician. These injections often include a combination of lidocaine and cortisone, and can be effective in relieving pain in the tender area. Joints are the region between your bones. Their purpose is to provide support and assist with function of movement. There are many joints throughout your body that can become damaged or inflamed due to a disease or condition. No matter what the cause may be, the joint can becomes painful and bothersome, which can affect movement and your quality of life. The pain typically will present in the immediate region but it can be referred to another body location as well. The goal of an injection would be to reduce or eliminate the painful discomfort as well as to preserve the integrity of the joint. Ultrasound is often utilized with these injections to facilitate guidance in place the needle directly into the joint. These injections are done in the office and may take approximately 10-15 minutes.